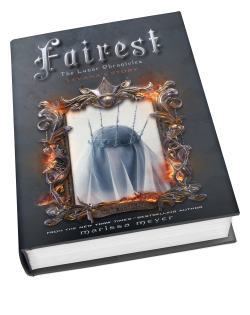 Up to this point, Levana has been a pretty unsympathetic and irredeemable villain, and I’m curious to know if Fairest will change my mind about that. I can’t wait for this book. This series is so incredible and I just have to know Levana’s story. So looking forward to this one! Oh, I hope you do. It’s a fantastic series! Thanks for stopping by, Rosie. YES. A THOUSAND TIMES, YES! I need this in my life right now. I lover Marissa’s books!! Me too. Her books are amazing. Thanks for visiting our WoW, Stephanie! Yes, yes, yes!! I’m so excited that we get TWO Lunar Chronicles books next year. And I’m curious to find more about Levana – she’s a very present character in LC so far, but we still don’t know much about her! And so much of what we do know seems to be based on rumours. I’m curious too. And a little worried. I’m not sure I WANT to feel sympathetic toward Levana… 😛 She’s just so perfectly and wonderfully EEEEEEVILLLLL. But… at the same time I am interested in seeing what influenced her to become the person she is in the Lunar Chronicles. Do it! Do it! It IS an amazing series, and I hope you enjoy it as well when/if you pick it up, Thanks for stopping by Kim! I’m dying for this one! I love the Cinder series! I want this book!! Great pick!! I can’t wait for this book! I think it actually comes out in January instead of June too 😀 Just a few more months till we can maybe see a slightly redeemed Levana 😉 But I’m still rooting for Cinder overall – she needs to be on the throne! I have to admit that I actually kind of hate it when authors do this (though I admit that the cover is awesome). I feel like it’s just drawing the story out longer and longer, when I really just want to get to the conclusion and know what happens! Yes! This book is a must. I’m a little sad to have to wait longer for Winter. But in the end, I think this one will be good and make it all worth the wait. Wow! This sounds like a great read! I think I’d enjoy this series! Fab Wow pick. YES, excellent choice! To say that I’m excited for this one too would be an understatement. I’m really curious to see if this will change the perspective on Levana as well! It’d be interesting (if maybe a little… uncomfortable?) to see her in a more sympathetic light.